The Russian Air Force is getting down to the official testing of their T-50 fifth-generation jetfighter in what is evidence that the aircraft is actually ready and can soon be passed into service. The T-50 flight tests have been scheduled to start at the Akhtubinsk flight test centre in March or April this year. Five aircraft are due to be tested, with the fifth T-50 having taken off in October 2013. Just a month later, the overall number of flights exceeded 450. Once the Russian Air Force gets 6 or 8 experimental T-50 jetfighters, the number of flights could easily reach 400 to 500 per year, which provides for carrying out the flight test programme of 2000 flights in a matter of three to four years. The first few T-50 jetfighters are due to arrive at the Lipetsk training centre of the Russian Air Force for retraining Russian military pilots in 2015. T-50 will become the first new-generation jetfighter that the Russian Air Force has adopted for service since the late 1980s, when the Su-27 was commissioned. 50 to 60 T-50 jetfighters are due to be bought by the Russian Air Force by 2020, while the overall number of T-50 to be adopted for service will make up 200 to 250. It is held that the first combat manoeuvre unit will be combat ready by 2017 or 2018. The new jetfighter should largely boost the Russian Air Force combat potential by replacing the now obsolete Su-27 and partly Su-30, and ensuring supremacy in hypothetical air combat clashes with the enemy who relies on updated fourth-generation and even fifth-generation jetfighters, such as the F-35 or the F-22, which is currently used by the USAF. The Soviet Union launched work on fifth-generation jetfighters back in the 1980s. By the mid-1990s, the Mikoyan Design Office came up with Project 1.44, while the Sukhoi Design Office, with Project S.37. S.37 was originally meant to hone some new technologies, so a new MIG jetfighter could have gone into production, but the Mikoyan project ground to a halt for lack of funding. It became obvious by the mid-1990s that the projects in question were growing morally obsolete and should therefore be given up. A decision to develop a basically new aircraft was taken in the early 21st century. The Sukhoi, Mikoyan and Yakovlev Design Offices came up with their respective projects. As a result, Sukhoi became the lead developer of the new aircraft, which came to be known as T-50. The F-22 designers have largely sacrificed performance characteristics for low-observability, while the T-50 designers focused on ensuring the acceptable combination of the former and the latter. As a result, T-50 boasts by far better performance characteristics, including cruising speed and flying range, which are crucial for a heavy jetfighter, such as T-50. All signs are the Russian jetfighter also boasts more capacious inner weapon compartments, which is a major tactical advantage. But the low observable technology was not sacrificed at all in the long run, since Russia has begun to produce new composite materials, radar-absorbing coatings, and the types of dyes that, if combined with an advanced aircraft geometry analysis and radar blockers in the intake duct passages, make T-50 a very low observable aircraft. The key factor in the T-50 kill potential is the jetfighter’s fire control system, including an active phased array radar in the fore-body and more antennas in the wings and the aft-body, ensuring an all-round view. T-50 is still more superior to F-35, which has failed to become a fully-fledged fifth-generation jetfighter, but costs nevertheless only slightly less than its predecessor, F-22. The cost of F-35 has been lowering recently as its series production gains momentum, but it’s not that easy to improve performance characteristics. Just as F-35, T-50 will be offered for sale abroad. 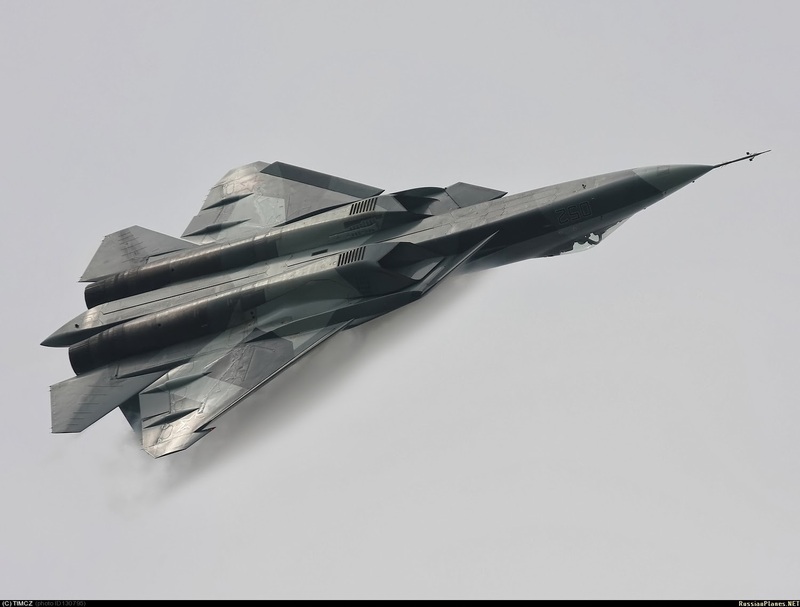 The first major project to that end is the Russian-Indian joint effort to develop a Fifth Generation Fighter Aircraft, FGFA, on the basis of T-50. Once FGFA is manufactured, T-50 is expected to emerge on foreign markets, just as an Indian contract many years ago became the hour of triumph for the Russian Su-30 aircraft, which has been the best-selling fighter plane in the past 15 years.